For ferrets,guinea pigs,chinchillas,pet rats,and other small animals,support up to 0-15 KG. Waterproof oxford fabric and fleece fabric,One side with waterproof oxford fabric, perfect for summer, one side with soft warm fleece fabric, winter choice. If you are like me you’ll know that if you want the best seat in the house, you’ll have to move the cat. 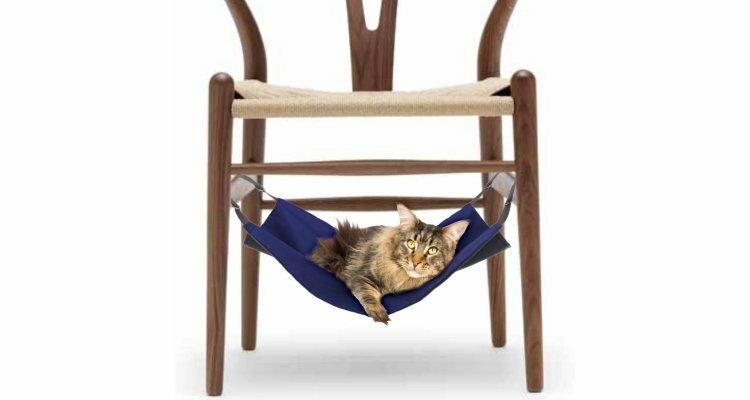 Well not any more, because your feline will love this cat hammock that attaches to chair or even table legs, providing your coddled moggy with comfort, privacy and warmth all in one. Don’t fight your cat – everyone knows who will lose that one. Cats love the warmth of human proximity, so when you are at the table you can still provide that warmth which will naturally drift from you through the seat to the hammock below. Your cat will be warm and cozy, and if you’re the type that likes to feed your pet during mealtimes, this is the thing for you! Simply slip all the disgusting bits on your plate that you hate straight down to the ground floor, where your cat will be waiting to polish them off. Kids who are fussy eaters will love this! The Cat hammock itself is made from soft comfortable sponge-clean flannel and the attachments are made from non-slip tape. The hammock is grey and the non-slip tape is black. Please check the size of your table or chair to which you plan to fit the hammock before ordering. This cat hammock is suitable for small to medium sized animals up to about 3.5Kg in weight. Measurements: Hammock size: 15.75″ x 15.75″ (40 cm x 40 cm). Four Corner Belt Length: 10.63″ – 11.02″ (approx 28 cm each).